This spring was a tricky one. Unseasonably warm weather felt like a huge relief from the crazy cold this winter, the down side being it made our asparagus bolt far too soon, which meant they were instantly far too tall and woody. Then the warm sun and wild rains rotted too many of the strawberries for my liking. I was lucky enough to pick just enough of those sweet, perfumy little berries to make a whack of strawberry rhubarb compote as well as some Canada Day Cheesecake. I’ll need to be even more ruthless next year to get as many as I can when the weather is dry…lesson learned. Tasty berries, wet with rain. These were scrumptious but did not last, even in the fridge. The moral: don’t pick in the rain…ever. Wet berries freeze well and make fine strawberry rhubarb compote. Enjoy just on its own, with a plain cake or yogurt. 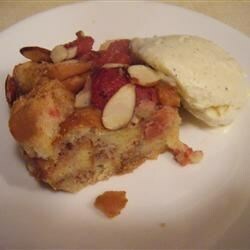 Here is a link to a Strawberry Rhubarb Bread Pudding recipe I am excited to try. If you do try it post a comment. I urge you to scoop up and enjoy any Ontario Strawberries and Rhubarb while they are still available! Wild Ontario Blueberries and Raspberries are starting to hit the farm stands too. Remember to only wash berries before use, then dry any extras really well and store in the fridge in a container lined with paper towel to maintain freshness. All this berry talk means we’ll need to cook up a mixed berry pie this weekend…mmmmm. Now picking fresh Organic veggies! Chickens arrive on a blue moon. We are delighted that Belanger Organic Farm produce and meats are in high demand by our consumers locally and in the Greater Toronto Area. We proudly supply discerning retailers, including The Big Carrot both the Eglinton and Queen St. locations of the Healthy Butcher and are at the Liberty Village and Newmarket Farmer's Market with farm fresh products every week. We take pride in our farm and the way we grow our crops and raise our livestock. As organic growers and farmers, we want only the best, all-natural produce on our family's table and your family's table. To make sure you can trust our guarantee, every crop we harvest here on the farm is 100% Organically Grown and government certified. Our farm products are grown and harvested without pesticides, herbicides, commercial fertilizers, animal feed supplements or food preservatives. Our cows and sheep are healthy and fed 100% Organic feed we grow right here on our farms. All our lamb and veal raised on our farm is government inspected before it gets to you. All the crops and produce we sell to our retailers or at local farmer's markets are harvested with care by hand, washed with spring water and packed for freshness. That's our family's guarantee to you! We won't ever grow or sell anything we wouldn't feed our own families. No herbicides, no pesticides, no chemicals. Period. Pure. Natural. Organic. You have our word on it - your family deserves nothing less than our family's best.